Lisa Goedert takes her inspiration from scientific line-drawings and mathematical illustrations. She loves the simple beauty of the Line. While she mostly works in an automatism fashion, she will later “go back in” and labor over capturing a certain rhythm to a line. Its thickness, curvature, and relationship to other forms are crucial in her work. Goedert also communicates using organic forms. Ovals and circles can symbolize the smallest of stones to the greatness of the cosmos. Seedy-like sprays of dashes and dots also add a visual rhythm and vibration. Goedert grew up near grassy fields with reedy ponds. These natural forms feel like math to her. Goedert enjoys the mysteries of the sea, space, and forest, and is inspired by the many patterns found in nature like those on a bird’s plumage, or the way tree branches cut across the sky. She does not need a great deal to tell her story working rather minimally. Her work is about energy. And she claims that when she works, she feels as though she is unlocking some sort of ancient memory and perhaps a bit of the little mysteries found in nature. Her hope is that she makes art that conveys a tranquility and wonderment of this life. 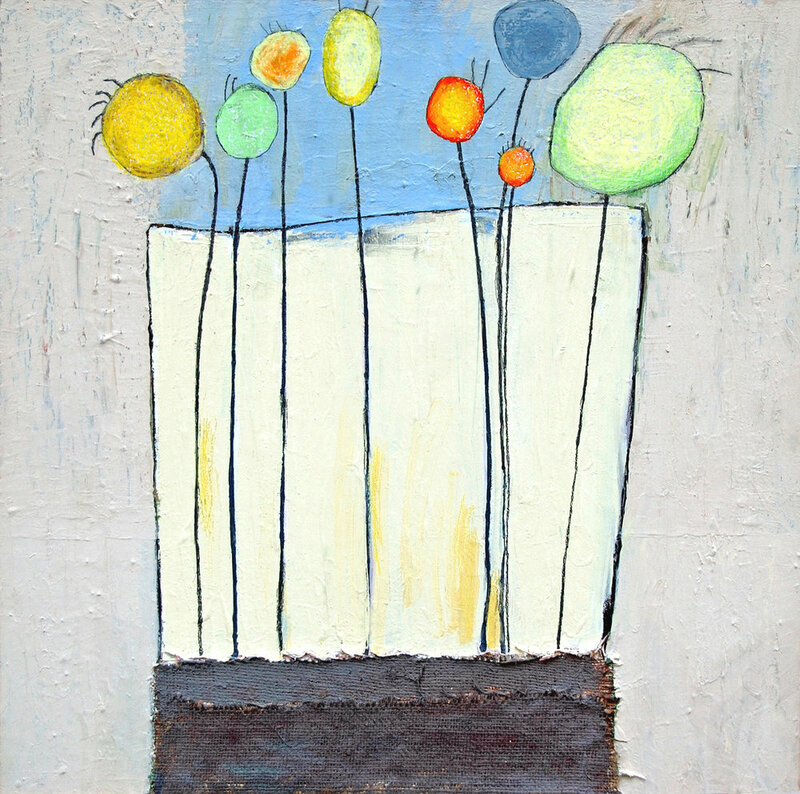 Goedert works from a luminous and whimsical place. She has a profound respect for nature and its many forces, be they majestic or playful.